Choose the best dice combinations to maximize your points and minimize the lives lost. 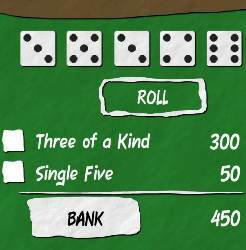 Each round starts with 6 dice and after each throw, you select which combinations you want to lock in and then either bank your winnings (if you have enough points) or throw again. If during a round you throw the dice and fail to improve your points haul, the round is over and you lose a life. Use the MOUSE and LEFT MOUSE BUTTON to throw the dice, to select combinations, and to bank your winnings. 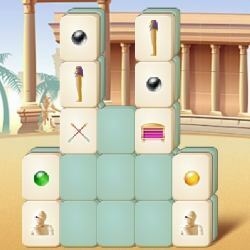 Click here to send Dice Challenge to your friends using your default email program.